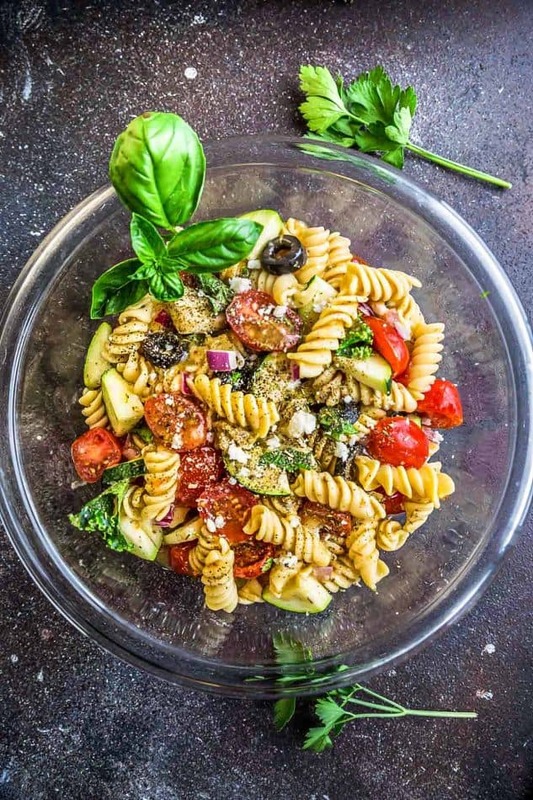 Italian Pasta Salad is an easy side dish perfect for summer barbecues, potlucks and parties. 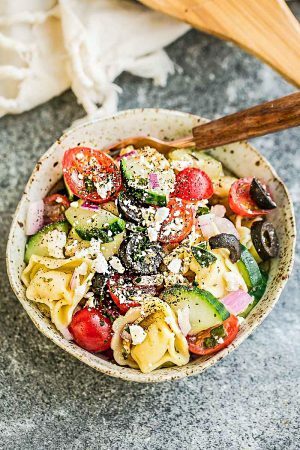 Best of all, this recipe is packed with cherry tomatoes, zucchini, olives, fresh herbs and yummy feta. The sun is blazing and summertime calls for quick and easy meals! 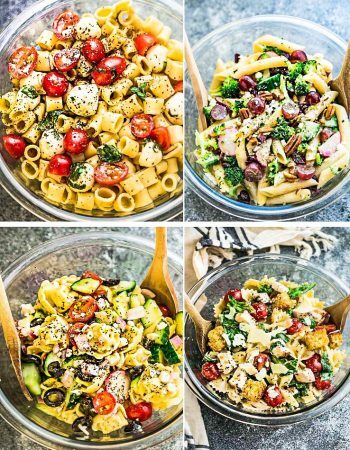 Pasta salads are just the answer when it comes to summer barbecues, parties and potlucks. 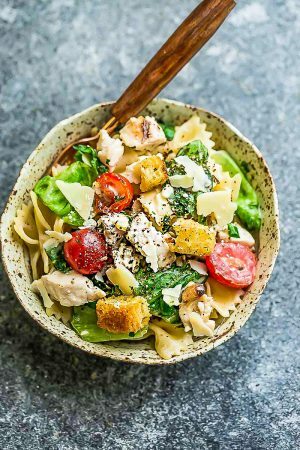 A few favorites we make again and again are: Chicken Caesar, Greek Tortellini, Broccoli Pasta Salad and Caprese Pasta Salad. They are easy, flavorful and I love that you can make them ahead of time since they keep well in the fridge. Plus they are super simple to customize with your favorite add-ins. 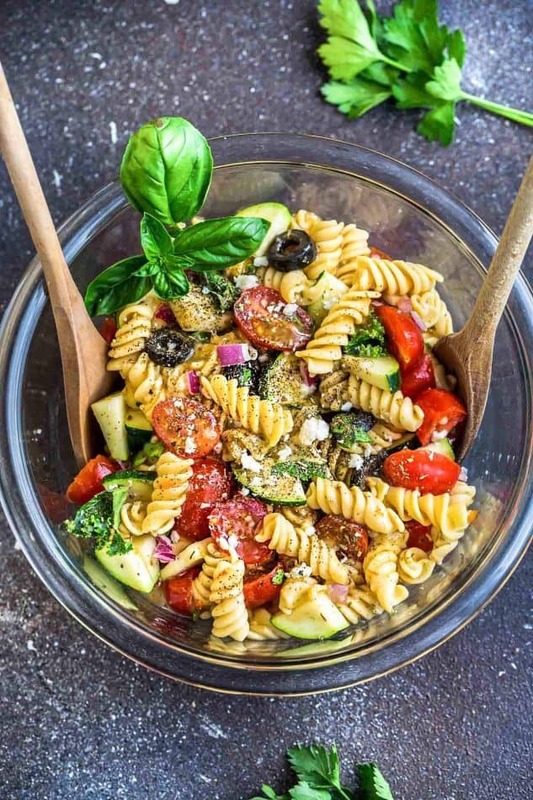 This Italian Pasta Salad is loaded with a ton of goodies and comes together in no time. 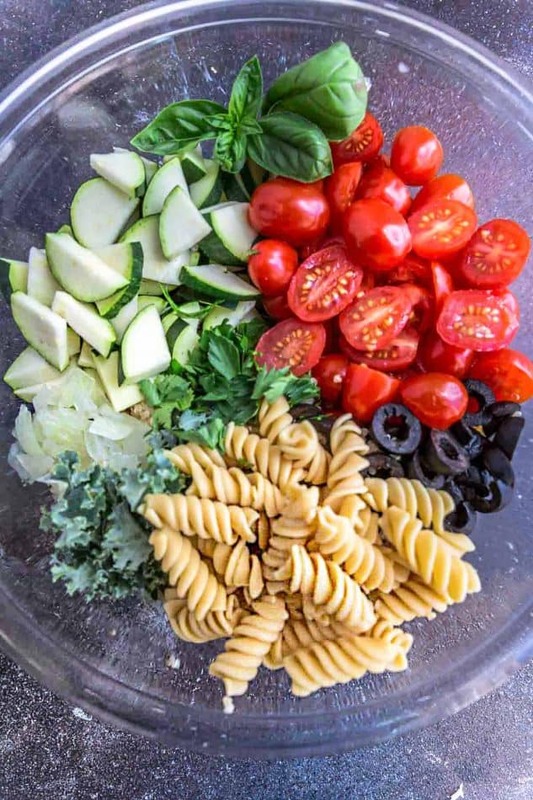 This salad starts off with some cooked rotini – (regular pasta, gluten-free pasta, or a different variety works as well – fusilli, penne). I used Banza pasta. 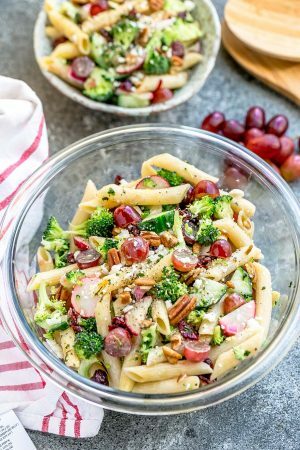 It’s a gluten free pasta made from chickpeas and is packed with protein and fiber! They were kind enough to send me some to try and my family is obsessed! My husband who is usually a picky eater about his pasta even loves it! You can check out their website for where you can find them locally. We also added some cherry tomatoes, zucchini, olives, onions, fresh herbs, and melt-in-your mouth feta. I couldn’t resist adding some chopped kale from my garden but you are totally free to leave it out if you are not a kale fan. 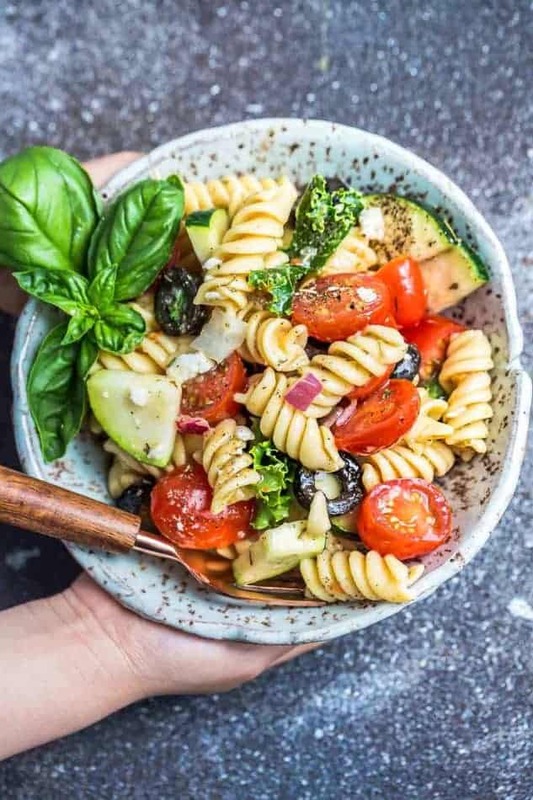 The zesty homemade Italian dressing comes together with a few simple ingredients and is really what makes this pasta salad shine. You can whisk all the ingredients together, shake in a jar, or give a quick whirl in a blender. 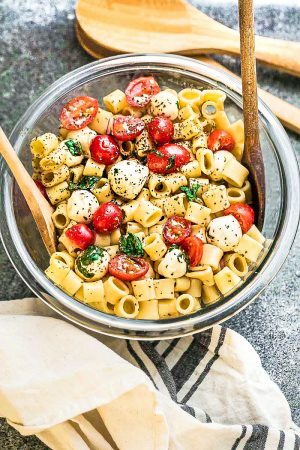 This Italian Pasta Salad keeps well in the fridge. The great thing is that it gets even more scrumptious as the flavors marinade in your refrigerator. Easy to make, packed with flavor, and a favorite every time. Disclosure: Banza provided me with some pasta to try, however all opinions are 100% my own. Place all the ingredients in a jar and shake well. You can also use your blender to emulsify ingredients instead. Cook, drain and dry pasta to al dente according to pasta instructions. Add to a large mixing bowl and toss together with 1/2 of the dressing. Add salt and black pepper to taste. Add the remaining salad ingredients to the bowl and add remaining dressing. Toss well and add salt and black pepper to taste. Chill in fridge until ready to serve or enjoy immediately.